Netflix movie Velvet Buzzsaw stars Jake Gyllenhaal as an art critic who becomes engulfed in weirdness when paintings by a mystery artist take Los Angeles by storm. That got us thinking about other horror movies featuring sinister and/or strangely animated artwork—so here are our favourites. Exploitation pioneer Herschell Gordon Lewis—affectionately known as “the Godfather of Gore”—directed this 1965 grindhouse flick that capped off his “blood trilogy,” after Blood Feast and Two Thousand Maniacs! It’s the sordid tale of a struggling painter named Adam who can’t figure out how to create the exact shade of red he needs to complete his latest work—until his girlfriend accidentally cuts her finger and he realises human blood is the answer. Suddenly, Florida’s richest patrons, gallery owners, and critics are eating out of his hand, though an increasingly unhinged Adam refuses to sell any of his newly red-hot paintings. He has no problem, however, slaughtering as many victims as necessary to keep his “paint” supply flowing, in all kinds of theatrically horrifying ways. It wouldn’t be an H.G. Lewis film without someone losing their intestines, after all. This richly photographed 1976 giallo from director Pupi Avati stars Lino Capolicchio as Stefano, an artist who’s hired to restore a crumbling church mural in a small town in Northern Italy. (The trailer above doesn’t have English subtitles, but the stateside DVD release obviously does.) As it turns out, it’s not just your run-of-the-mill religious fresco—it’s a lurid depiction of the grim murder of St. Sebastian—and the original artist was quite an unusual fellow who drew gruesome inspiration from his own hideous crimes. Further complicating matters: Stefano is staying in the creepy house once owned by the man’s sisters, and (in true giallo fashion) there’s a contemporary murderer prowling the village who’s keenly interested in preventing the curious Stefano from playing amateur sleuth. Another giallo, this one’s a lesser-known entry from a director that everyone has heard of: Dario Argento, who made the original Suspiria. Purportedly the first Italian film to use CGI, this 1996 thriller stars Argento’s daughter, Asia, as a detective whose pursuit of a murderer takes an odd turn when she develops the title ailment, swooning and falling into a hypnotic trance in the presence of certain works of art (The Night Watch by Rembrandt and Landscape With the Fall of Icarus by Bruegel, specifically). Since the killer is lurking in museum-filled Florence, this proves most inconvenient—and very nearly deadly when the detective is captured by the maniac and horribly tortured, an ordeal that ends up having some devastating and lasting consequences. Most of The Stendhal Syndrome is pretty brutal and stomach-turning, but the scenes in which the main character believes she’s actually falling into the worlds of the paintings are weirdly beautiful. 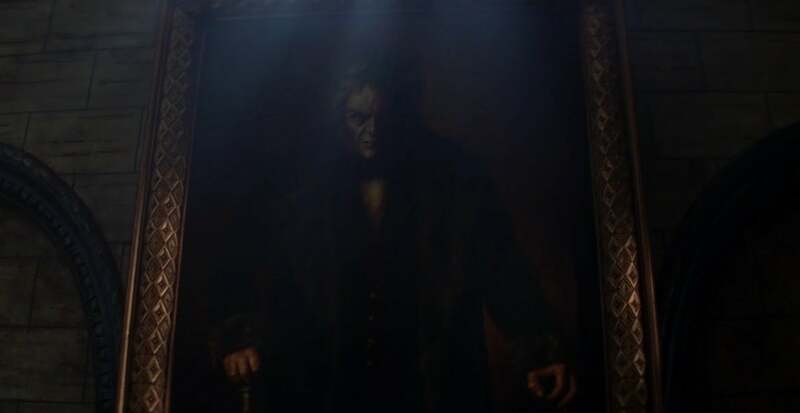 As if we weren’t going to mention Vigo the Carpathian, whose certified status as “one ugly dude” (per Ernie Hudson’s Winston) doesn’t prevent him from having an oversized museum portrait that just happens to be totally haunted. He’s able to hypnotise unctuous art restorer Dr Janosz Poha (Peter MacNicol) into assisting him with his dastardly plan to reanimate himself, but fortunately the Ghostbusters are there to protect Dana Barrett’s adorable toddler from being an earthly vessel for the 16th-century madman once he starts creeping out of the paint—as well as rescue all of New York City from succumbing to Vigo’s slime-fuelled bad vibes. Shirley Jackson’s classic horror novel inspired an excellent 1963 film and Netflix’s also-excellent The Haunting of Hill House—as well as, bringing up the rear, Jan de Bont’s 1999 tribute to houses that are just “born bad.” Aside from Catherine Zeta-Jones’ haute couture Hot Topic outfits, the most memorable part of The Haunting is probably its excessive use of CGI to bring its spooky elements to life, a contrast to the 1963 version’s reliance on emoting and camerawork to telegraph its frights. At any rate, the cursed mansion’s lavish decor features lots of oversized art, including cherub statues and giant carved ornamental doors, that comes to life at pivotal moments—but none so notable as the enormous portrait of its hulking, orphan-slaying former owner, who bursts forth into the film’s questionable reality at a climactic point to growl at the hapless humans in his path. 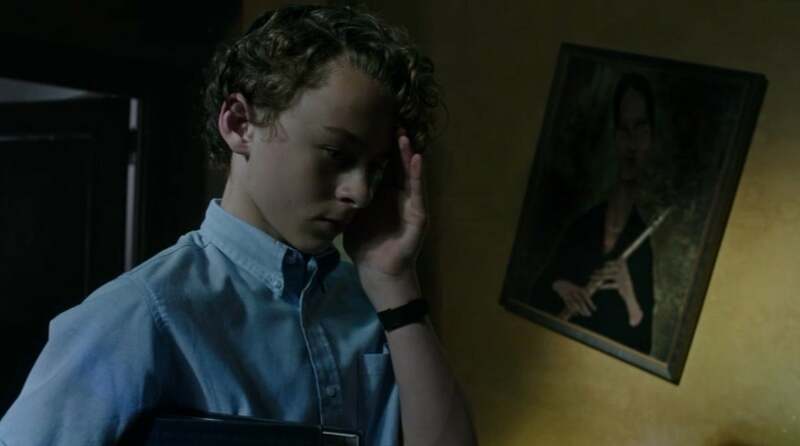 Losers Club member Stanley Uris was already freaked out by that eerie painting displayed in his rabbi’s office—you know the one, with the off-kilter woman clutching a flute—long before he knew anything about Pennywise the Dancing Clown. But things get so much worse when he’s singled out by the dreaded demon who delights in targeting everyone’s worst fears. First, the painting falls off the wall, and when Stanley goes to re-hang it, he realises there’s a blank space where the figure once was, suggesting the woman has slithered out of her two-dimensional prison. Then...as the lights flicker...a flute begins to play ominously, and the woman suddenly appears to menace poor Stanley in the dark with a suspiciously Pennywise-like grin. Later, she reappears in the sewer and proceeds to clamp her suckerfish-like maw, with its rows of pointy teeth, around Stanley’s screaming visage. It’s one of It’s most disturbing moments, and that is saying a lot. There’s a new adaptation of Roald Dahl’s truly unsettling—and yet aimed at children—novel on the way, but we’re still having nightmares thanks to the 1990 version starring the fantastically evil Anjelica Huston. Though The Witches contains plenty of in-your-face (and under-your-face, as it happens) horror, the Nicolas Roeg film has lots of chilling small details, too. For instance, early in the film, before we get hard evidence that witches actually exist, main kid character Luke (Jasen Fisher) hears a story from his grandma (Mai Zetterling) about a childhood friend of hers that disappeared—because she was kidnapped by a witch, and imprisoned in a magical painting that shifted over time to show her ageing and eventually vanishing completely. Though most of The Witches focuses on the coven’s present-day fiendish plot to transform every kid in England into a rodent, that tale from the past sets the tone from the start—and there’s an echo of the cruel trick in a different painting that’s glimpsed a bit later in the film. John Carpenter pays tribute to Stephen King, H.P. Lovecraft, and The Twilight Zone in this legitimately unsettling tale of insurance investigator John Trent (Sam Neill), tasked with tracking down a best-selling horror author who’s gone missing—along with his hotly-anticipated latest manuscript. The search takes Trent to a small town in New Hampshire where everything just seems off. As we soon learn, nothing is what it seems, but before reality begins to completely fragment there are some nifty clues hidden in the production design—like a painting in Trent’s B&B that can’t hold its scene steady. First, it’s a couple holding hands in a lovely country setting; mere seconds later, the couple has turned to look at something in the lake behind them. 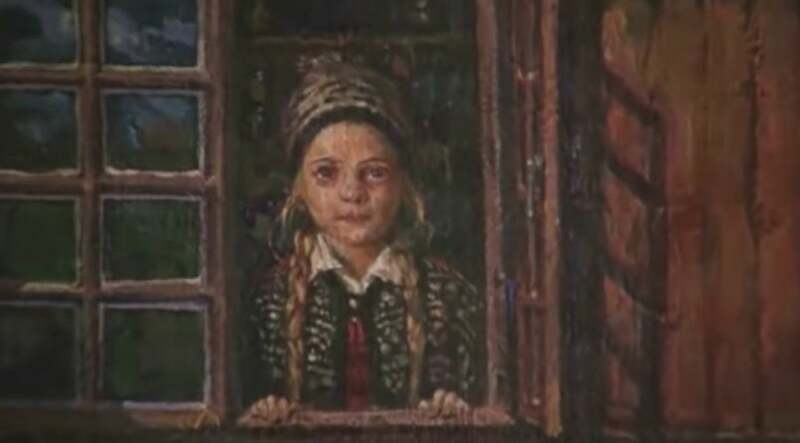 Then, the couple has turned to look outward, but their faces are distressingly distorted—and later, the painting is revealed to have completely transformed into a nightmarish scene, something that might, say, be perfectly suited for illustrating the cover of a horror novel. Spike Lee executive-produced Rusty Cundieff’s 1995 horror anthology, about of a trio of South Central guys who think they’re collecting a stash of drugs to sell from the eccentric neighbourhood mortician, but are instead regaled with a series of spooky tales (before realising the mortician is not who they thought he was, and that their own story has a most unfortunate ending). 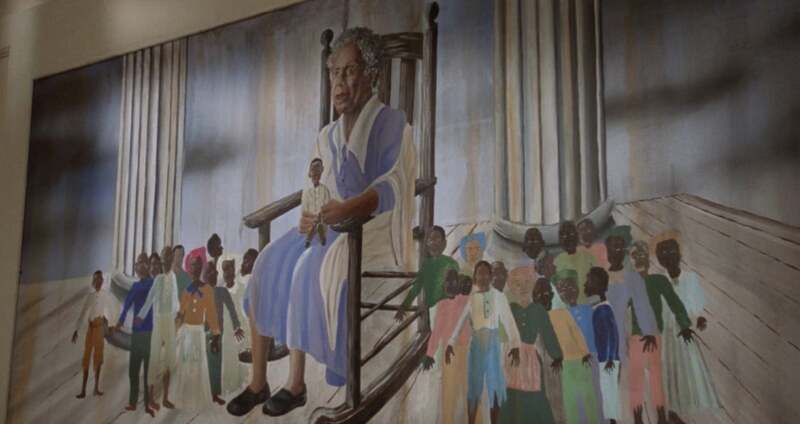 At any rate, one of the segments is about a racist, hateful, arrogant ex-KKK leader turned politician (Corbin Bernsen) who moves into a former plantation house haunted by the ghosts of murdered slaves—and gets exactly what he deserves, thanks to a painting that unleashes a witch and her doll army (rendered in killer stop-motion) in the name of revenge. Tales From the Hood is the rare example of an enchanted painting where the viewer is actually rooting for the ghosts to bust out and do some damage because Bernsen’s character is truly monstrous and repulsive. Valak, the demonic nun, made such an impression in The Conjuring 2 that she eventually got her own spinoff movie. But there was nothing in The Nun that could match her sudden, shocking appearances in the earlier film—first in a vision by Lorraine Warren (Vera Farmiga), and later in a spectacularly alarming painting by Ed Warren (Patrick Wilson), who explains that he had a “crazy dream, saw this thing, and when I woke up, I couldn’t get it out of my head, so I thought maybe this might help.” Nope. Not helping, Ed...just creating some absolutely horrifying imagery for the rec room. Before long, Lorraine has another vision—which, of course, the viewer doesn’t realise is a vision at first—and lighting tricks make it unclear whether you’re seeing a painting in the shadows or an actual figure glowering behind her. Soon it’s quite clear that the worst is true and you’re seeing both, as the ghastly portrait “comes to life” in one of the movie’s most shriek-worthy scares.